It would appear that Amazon is steadily taking over the retail world, accounting for 43 percent of all online sales last year in the US, up from 33 percent in 2015. Seeking greater growth, it was only a matter of time before Amazon took aim at the apparel space. After first wading into the fashion industry over a decade ago with Shopbop, Amazon has grown to become the biggest online seller of clothes in the US, with apparel sales totaling $16.3 billion in 2016. In addition to selling big brands like Calvin Klein and Levi’s, the retail giant also recently launched seven of its own private-label clothing brands. According to Morgan Stanley, Amazon has the second highest overall apparel market share, nipping at Walmart’s heels. In a survey, Morgan Stanley found that 46 percent of respondents purchased clothes on Amazon last year, beat out once again only by Walmart. What fashion brands can do however, is take advantage of the fact that Amazon is a jack-of-all-trades and a master of one. In recent years, the “king of retail logistics” has invested in regional warehouses and information technology, introducing one-hour and Sunday delivery, as well as a drone program. Arguably there’s no other company better at logistics than Amazon. As an apparel brand, it makes sense to take advantage of that. Of course, the downside of teaming up with Amazon is the fact that you sacrifice a direct connection with customers—and your ability to provide an engaging, highly relevant post purchase experience, while at the same time gaining insights into the customer’s behavior and buying habits. 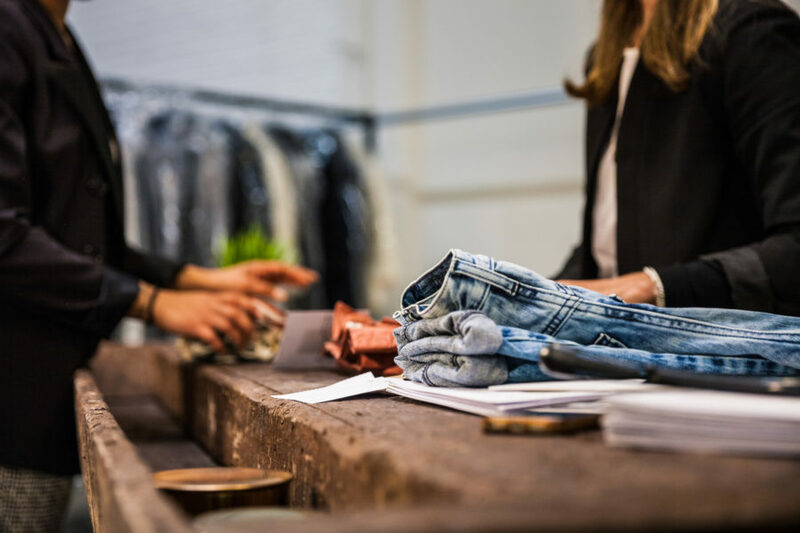 This lost connection with the customer is driving apparel brands to rethink their current position and seek out a smarter solution. Partnering with global packaging leaders such as Avery Dennison RBIS, EVRYTHNG has made it possible for billions of physical products to be connected to the Web at the point of manufacture via unique digital identities (a phenomenon that we call products being #BornDigital). These digitized products accumulate data throughout their lifecycle, giving brands the ability to unlock hidden value, including a direct relationship with their end-customers. Let’s take an example: A consumer could buy a pair of Levi’s on Amazon right now and get them in an hour thanks to the e-commerce leader’s world-class logistical system. Obviously this is going to sway Levi’s customers, especially those short on time. Today, Levi’s has no visibility into that customer or sale on Amazon. This is where digital products can be leveraged. It’s as simple as placing a smart label or tag on the jeans, which allows the customer to interact with the product to gain tangible value such as unique content, offers and rewards, enabling Levi’s to establish a direct connection with its end-consumers, irrespective of where the jeans are purchased. While some fashion labels see Amazon becoming a direct competitor with their brands, it’s impossible to beat Amazon at its own game of retail logistics. Instead, apparel brands can apply a “jiu-jitsu” move by using Amazon’s strengths to their advantage and by leveraging smart, digital products that allow them to win back their customer relationships and own their customer data.